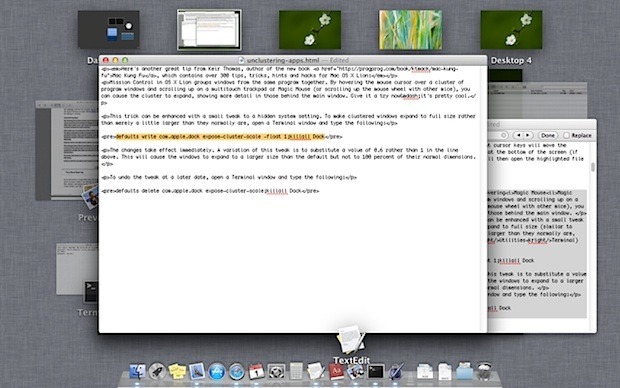 Mission Control in Mac OS X groups together thumbnail previews of windows from the same app. By hovering the mouse cursor over a cluster of these thumbnails and scrolling up on a multitouch trackpad or Magic Mouse (or scrolling up the mouse wheel with other mice), you can cause the cluster to expand, showing more detail in those behind the main window. Give it a try now—it’s pretty useful. The changes take effect immediately. A variation of this tweak is to substitute a value of 0.6 rather than 1 in the line above. This will cause the windows to expand to a larger size than the default but not to 100 percent of their normal dimensions. Like this tip? Don’t miss our other Mission Control tricks. Is there a link to that flower wallpaper? It looks really nice! Too bad this doesn’t work in Expose. That would be very helpful when multiple windows are open, in Safari for example, and you need to zoom in on each of them to properly identify them. Is there another defaults write command to enable that functionality?